Vince Camuto has launched Bella, a new fragrance for women. Transform yourself with a delightful spritz or two of Bella, the newest Vince Camuto fragrance for women. A blend of nectarine blossoms, jasmine water and Italian bergamot raise the bar for this juicy scent. A base of white amber adds a warm and seductive nature to the feminine fragrance. This simple luxury comes packaged with a grosgrain ribbon tied around a mystifying gold cap. 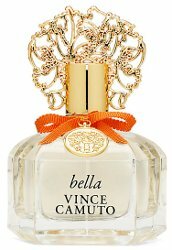 Vince Camuto Bella is available in 100 ml Eau de Parfum, $78. Update: Bella was developed by perfumer Yves Cassar; additional notes include peach, pear, lemon ice, strawberry flower, solar musk, sandalwood, blonde woods and caramelized wood. I will seek this out – no shame. I just purchased the original Vince Camuto from TJ Maxx for $12 and I can’t stop wearing it. It’s a sweet “floriental,” the cap is ludicrous (and the charm on the ribbon annoying), but something about it makes me smile. It’s like my version on Fancy Nights or all the dumb Juicy Coutures and their ridiculous names (“Couture Couture by Juicy Couture” anyone?) – something others might look askance at, and I can’t explain why it works for me, but it does. lol, the “mystifying” descriptor didn’t even register. What do you think they mean? “Beguiling” maybe? I did not see it at TJ Maxx this week, but you never know…your store could have it. God help me, I like those goofy bottles too. Haven’t much liked either of the ones I sniffed, but hope springs eternal. This one looks good, as long as the nectarine note is true.